You'll find some really interesting aborigine art next to the Melbourne Aquarium. It's called Scar - A Stolen Vision. It was created by eight indigenous artists and is intended as a symbolic representation of the scars of all Indigenous people and the ongoing process of healing. The 30 poles represent the Victorian landscape. 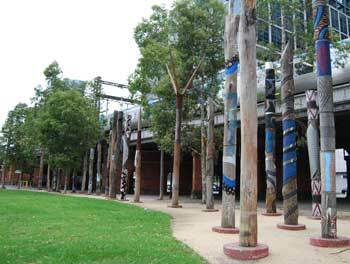 Each pole represents a different aspect of aboriginal life, history or mythology. .........The chains attached to these symbols represent the period when aboriginal cultural material began to be collected by various institutions, missionaries and early farmers. ........Being denied this knowledge is a form of cultural genocide according to the criteria of the United Nations. 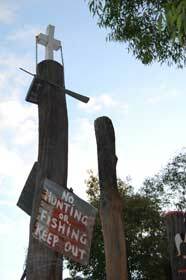 .........Hence the presence of the bible and the gun hanging from the top of this pole leaving a scarred vision. .......But now you've read this you'll be looking at the poles a lot more carefully than I did before I read up about them recently.